Also known as EIA/TIA 574. 9 PIN DE-9 MALE at the Computer. 9 PIN DE-9 FEMALE at the Cable. RS232 column is RS232 circuit name. 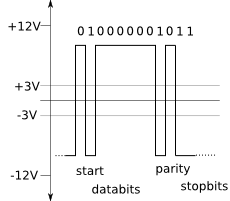 V.24 column is ITU-TSS V.24 circuit name.